I tested AIDA64 with Koolance TMS200 and TMS-EB200 Expansion Board. AIDA64 almost works fine but I can't found TMS-200 sensor info in AIDA64. 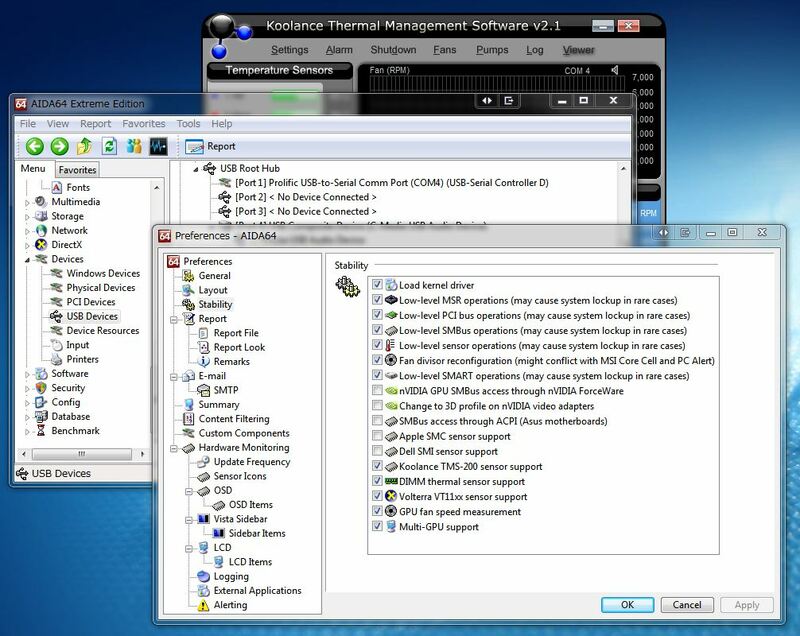 TMS-200 sensor readings are displayed among other, classic sensor readings on the Computer / Sensor page. You can also put those readings onto the OSD Panel, Logitech G15/G19 LCD screen, etc. I know sensor page displays various data. But TMS-200 sensor data are NOT displayed on sensor page, OSD, sideber gadget and LCD item. Please right-click on the bottom status bar of AIDA64 main window --> System Debug --> Devices Dump. Copy-paste the full results into this topic. Based on that data we'll check why AIDA64 cannot pick up your TMS-200 device. Maybe you use a newer or older revision of TMS-200 than what we have in our labs. 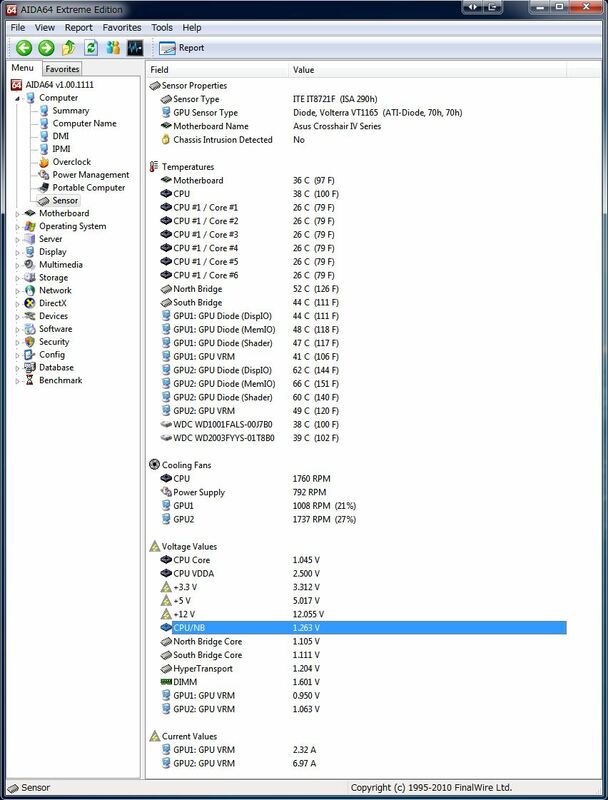 MY PC's device dunp is below. so in reality tms200 support is pointless unless you want to lose the ability to control all the components connected to the card that the tms software controls.. great. 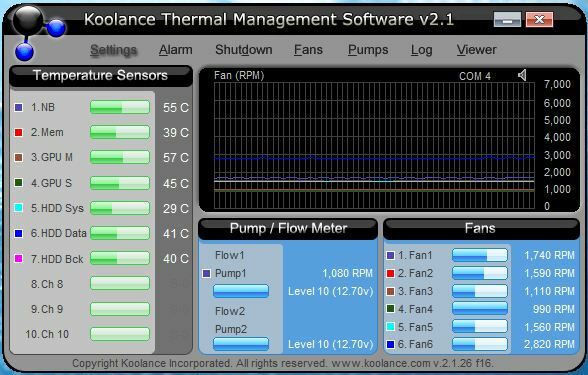 maybe you could contact koolance to see if there is any way to monitor the application instead of the hardware ? We've contacted Koolance to find out whether they would be interested in teaming up with us in order to come up with a solution so multiple software can access the TMS-200 device simultaneously. I'll let you know in this topic about their response. i guess the problems with the vitual com port not allowing more than one application to query it. hence me thinking you need to be able to monitor there software and not the hardware. i was under the impression there software was now open source ? Even if it is open source, we are not in a position to modify a software made by another vendor. We've got a reply from Koolance meanwhile. It seems they're open to discussions in order to fix this issue. We'll come up with a way that based on the existing hardware, but by an updated Koolance software and an updated AIDA64 version it will be possible to read values in AIDA64 even when Koolance's own software is running. I'm not sure about the time frame, but judging by the quick and professional reply we've got from Koolance, I'm sure it won't take forever to get there. I'll post updates about this matter in this topic. "Currently, the AIDA64 software maker says it won't work simultaneously while the TMS-200 software is open. Our lead programmer is working with them on that".